"We spent Sat and much of Sunday preparing The Goose for tech. After passing tech Sunday afternoon we had a freak thunderstorm, which left 2 inches of standing water on the Salt. Racing resumed Tuesday morning! We made our first pass that day after waiting in the starting queue for over 4 hours. By the time Terry set off from the starting line a very brisk crosswind had come up. He found the bike being blown from one side of the course almost hitting a marker flag on the opposite side. This was in the measured mile. He backed off the throttle. Later, he said that he was at 1/2 throttle and accelerating when the gust of wind hit him. The result was 115.929 mph. This was enough to break the Sid Biberman Vincent’s standing record of 109.079. By the time that we got the bike back to the pit, the wind speed had not died at all. It was decided not to make the return pass, which would be needed to post a new record. The next morning it was another long wait for our turn to run. Terry got off the line in good fashion and the bike sounded good thru 1-3rd gears. At the top of third, a little change in the motors rhythm was heard. While on the way down the return road, we heard the announcer say that our bike had run 59 MPH! Once back at the pit we found the rear cylinder had a holed piston. That was end of racing for The Goose!" And, indeed that was the end of racing for the Grey Goose ...for 2012. The motor is back in my shop, apart and waiting for new pistons. If you read the previous posts on this engine build, then right about now you are no doubt saying to yourself, "So, welding the pistons turned out to be a bad idea after all!" Or maybe even, "What kind of moron would weld on pistons anyway?" I must admit, those were my first two reactions also. After discussions with various sources ranging from fuel manufacturers to legendary engine builders, it seems not to be so cut and dried. (And a big thank you to John for taking the initiative to seek out those conversations!). First off, a few clues. 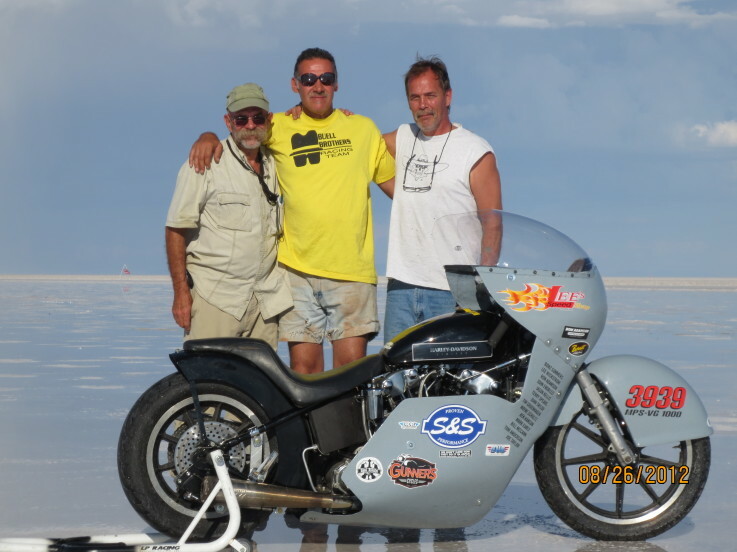 The front piston survived its excursion to the Salt Flats with absolutely no sign of any problem. The team had not yet even started to lean out the jetting from its Minnesota baseline. That in itself makes the possibility of a lean condition being the culprit very improbable. The rear piston not only had a hole through the flat of the intake valve relief, it had also started to "sag" on the flat of the exhaust valve relief. Drilling a small hole through the center of the "sag" allowed me to get an accurate measurement of the thickness at that point. It was approximately .200" thick, which was just about the figure I was shooting for when I modified them. The "sag" along with the appearance of the hole itself lead me to think that it was a heat problem rather than a detonation problem. But all of that really left me none the wiser as to what had actually gone wrong. Obviously new pistons that would not require the drastic modifications I performed on the last set were in order. And I may have left it there, trusting that the hole in the piston was due to my overzealous welding in pursuit of compression, but for one dissenting opinion. One of the experts who John contacted in search of answers was Minnesota's own Mike Roland. Mike did not think that the welding was to blame. 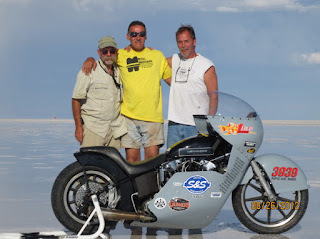 In fact, were it not for the fact that I personally believe that Mike is one of the brightest people to ever get involved in the Harley performance arena, I would have dismissed his idea without giving it any thought. But when Mike speaks, I tend to listen; and closely at that! When John contacted Mike for his thoughts, he immediately asked if it was the rear piston, and if it was a dual fire ignition. Yes, and yes. 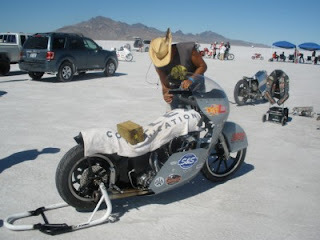 Well, it seems that at Bonneville, it is very common for Harley's to hole (using "hole" as a verb) the rear piston when using a stock style dual fire ignition. I did not know that. The team members for the Grey Goose did not know that. 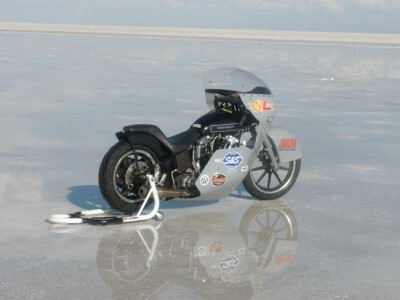 Judging from other Bonneville stories I have since heard which feature "holed pistons", many others did not know that. John's conversation with Mike Roland suggested a cure for the holed piston phenomenon (single fire), and even a reason for it (dual fire), but not an explanation. That is not to say Mike did not have an explanation ready; just that John did not ask for one. This left me with several options. I could dismiss the dual fire scenario as the cause of the hole in the piston ...but I have too much respect for Mike's reasoning skills to make that mistake. I could just go with Mike's advice and tell the team they need to switch ignitions. That would be the simplest solution, but hardly gratifying intellectually. I could give Mike a call and ask for his explanation. That would certainly be the quickest, but where is the satisfaction in that? Sort of like turning the page over to get the answers to a crossword puzzle rather than fully exercising you brain to get them. That bring us to the last option, and the one I ultimately went with: I could sit down and spend the time to figure out why a dual fire ignition could cause the problem. My conclusions will be the subject of another post in the very near future, Lord willing. In the mean time, readers are encouraged to submit their ideas in the comments section. I already have my own explanation worked out and I promise not to borrow from anyone else without giving proper credit. Less than forty-eight hours to go. That's right, as I sit down to write this there are less than 48 hours left until the Mayan Calender expires and the world ends. Sort of the new age version of Harold Camping's doomsday prophesy from some time back. Now, I no more expect that the world is going to end on December 21, 2012 than I believed in Camping's nonsense (or Al Gore's nonsense for that matter) and the date may have slipped by without notice had it not been for my lovely wife. You see, my better half works in an office that attracts far more than its share of new age wackos. One of them recently asked her if she was frightened by the prospect of the upcoming world's end. Talk about a wide open witnessing opportunity! ....but my wife is an employee, so stealing her boss's time, even for a such noble purpose, is just not in the cards. But that doesn't mean I can't get in on the action, so here goes. Are you frightened about the end of the world? Actually not such a bad question. The Bible tells us this in the book of Hebrews: And as it is appointed unto men once to die, but after this the judgment: That ought to cause all but the most hardened to pause for thought. Suppose the world did end this Friday. What then? Well, the implication of the "world ending" is that we would all die. But the truth of the matter is this: its much more likely that YOU will die this Friday. No, I don't have some inside information about you personally, in fact chances are very good I have never met you. But look at the statistics on death. A whole lot of people die every day. Do you think you will never be one of those statistics? While you contemplate your own mortality, though, don't forget the second part of that verse from Hebrews: but after this the judgment. So just when you have started to come to terms with the fact that you could die at any time, I go and throw the concept of judgment into the mix. Fine ...you can pretend that there is no God, and/or that there is no judgment ...that the Bible is not the Word of God, or it has mistakes, or whatever other little dodge you use to soothe your conscience ...doesn't change a thing! The answer of course can be found in the line after the one quoted above: So Christ was once offered to bear the sins of many; and unto them that look for him shall he appear the second time without sin unto salvation. There is only one thing that save you from things going very badly in that judgment, whether said judgment happens years from now, on Friday when the Mayan Calender expires, or later tonight. That is the blood of Jesus Christ. Unless you have already put your trust in the Lord Jesus and his sacrifice for your sins, there really needs to be a sense of urgency, end of the world or not. The Old Testament book of Kings tells the tale of the vicious cycle of God's chosen people backsliding, and eventually repenting, only to backslide again. Through all of those cycles, more often than not, the national tone was set by the King who was in power at the time. Both Judah and Israel had kings who followed the LORD, and those who did not, at various times in their history, though it seems that Israel always had more than their share of wicked kings. When you consider the wicked kings, most would agree that Ahab was the worst of the worst. His bad reputation is perhaps only exceeded by that of his wife Jezebel. That is the backdrop for 1 Kings 18. Ahab and his wife Jezebel reigned over the nation of Israel. They had caused the people to worship a false god named Baal, and had even broken down the alters of the one true God. And it came to pass, when Ahab saw Elijah, that Ahab said unto him, Art thou he that troubleth Israel? And he answered, I have not troubled Israel; but thou, and thy father's house, in that ye have forsaken the commandments of the LORD, and thou hast followed Baalim. Here we have the Biblical version of the showdown at the OK corral, or as my title suggests, showdown at mount Carmel. Why do you suppose that the people did not answer him? The answer is right here in the verse. They didn't answer because their opinion was divided. On one hand they were the children of Israel, God's chosen people, and they remembered that. But they also had been led away into idolatry, mixing worship of the God of Abraham with worship of the gods of other nations; in this case the Phoenician deity Baal. Now, who says a Christian should never use sarcasm? Should never mock false gods? It seems that Elijah thought it was proper! At this point one might be tempted to think Elijah is just showing off, but certainly there is more to it than that. We already heard that Elijah took 12 stones to build this alter, which represented the 12 tribes of Israel, who were chosen by God to be his people. Here we see that three times, four barrels of water were poured over the sacrifice - in other words a total of 12 barrels. Now if those 12 stones represented Israel and the worship they should have given God, then I think the 12 barrels of water may just represent Israel's resistance to that worship. Just a couple of observations and applications. The LORD our God is a jealous God who is worthy of worship. When we elevate some one or some thing to a place of more importance, or even equal importance to God, we are guilty of idolatry just as the nation of Israel was here in our story. The prophets of Baal were not just Israelites who had veered off course and mixed idol worship in with worship of the one true God, they completely rejected the LORD. They were enemies of God. The big question is, which side are you on? Now, unless you are a prophet of Baal, or have otherwise set your heart solidly in opposition to God never to be changed, then it is not too late. If you will turn from your sin and trust in the Lord Jesus as your Saviour, believing that he paid for your sins on the cross and arose from the dead, then you too will become one of God's people. The miracle that the LORD will work in your heart will be just as dramatic as when Elijah called fire down from heaven!